Sanitation workers have to navigate busy streets using heavy machinery, making this job a lot more perilous than it may seem. "Our guys start out in the morning with an empty truck and by the end of the day, it's full," said Harry Nespoli, union head for New York City's sanitation workers, "All that time, you're in the street and you put your life on the line." Waste collectors working city streets like Nespoli's men don't suffer a lot of high-speed accidents but they do endure impatient drivers, rushing to squeeze by the sanitation workers and their trucks on the narrow streets. Workers are struck and injured or killed. Workers not only have to watch their backs, but they also have to be careful about what they're handling. Hazardous waste sometimes finds its way into garbage and can be quite dangerous. "Back in the 1990s, we lost someone who was handling acid," said Nespoli, who worked on a truck for 10 years before becoming a union rep. "The truck cycled and the container of acid was crushed. It exploded and splashed into his face and down his throat." Fatal occupational injuries have diminished in recent years with more focus on training and better safety equipment. More visible outer clothing also helps, he said. Fatigue is another issue. 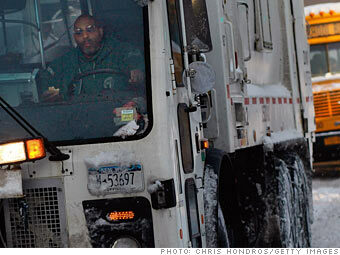 The average New York City sanitation worker lifts and loads more than five tons of refuse each day. By the end of a shift, judgment can get impaired and workers can get less careful. "If you don't focus on what you're doing, you're asking for trouble," said Nespoli.